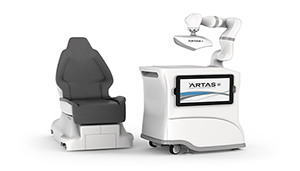 Restoration Robotics, the global leader in robotic hair restoration, today announced that Dr. James Harris, MD, FISHRS, FACS, will introduce the ARTAS iX™ Robotic Hair Restoration System at a symposium presentation during the International Master Course on Aging Science (IMCAS), being held January 31 – February 2 in Paris, France. Dr. Harris is an internationally renowned hair transplant surgeon and chairman of the International Society of Hair Restoration Surgery’s (ISHRS) FUE Advancement Committee. He is widely recognized as an innovator and pioneer in the field of hair restoration and is the founder of the patented Harris S.A.F.E.™ System, an advanced method of follicular unit extraction (FUE). Dr. Harris was a principal investigator in the development of the ARTAS System. With the recent addition of the new ARTAS iX technology to his practice, Dr. Harris became the first physician in the world to perform robotic implantation in a commercial hair restoration case. The ARTAS® Robotic Hair Restoration System is the first and only hair restoration system in the world combining robotic and artificial intelligence technology designed to assist surgeons through the most significant and tedious stages of the hair restoration process. It provides the most advanced and comprehensive offering for precise, efficient, and repeatable hair restoration and automates the most significant aspects of hair transplantation procedures: graft harvesting, recipient site making, and with ARTAS iX, implantation. The ARTAS iX Robotic Hair Restoration System provides the only solution utilizing machine-based vision, machine learning, and artificial intelligence to offer harvesting and implantation functionality in one compact platform. ARTAS iX is equipped with a 3D-camera stereoscopic vision system with improved 44-micron resolution and a 7-axis robot arm to deliver unmatched procedural analysis, precision, repeatability, and clinical workflow efficiency. For more information on the ARTAS iX system, please visit artas.com. Restoration Robotics, Inc. is a medical device company developing and commercializing the ARTAS® and ARTAS iX™ Robotic Hair Restoration Systems. The ARTAS iX System is the first and only physician-assisted system to dissect and assist in the harvesting of follicular units directly from the scalp, create recipient implant sites using proprietary algorithms and implant the hair follicles into the designated sites. The Company has unique expertise in machine vision, image guidance, visual servoing and robotics, as well as developing intuitive interfaces to manage these technologies.